From half price pedicures to cheap jive lessons to exclusive restaurant deals, Groupon offers you daily deals in your local area. The deal only activates if enough people sign up, encouraging customers to promote the deals and the collective buying power guarantees the merchant a minimum amount of business. Groupon keeps half the money and the merchant gets the rest. Groupon has been applauded for making this innovative business model work. On the face of it, it sounds like a win-win arrangement. 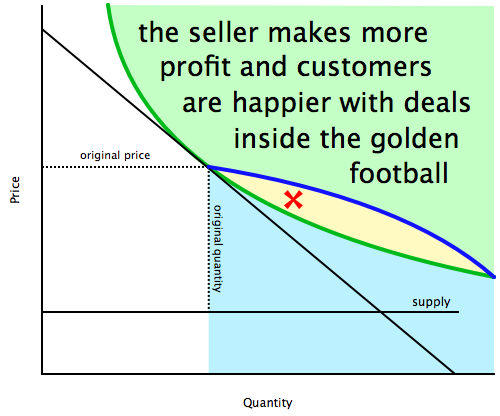 The customer gets cheap stuff and the merchant gets increased sales and profile of their product. However scratch under the surface and Groupon doesnt always provide the best experience for the consumer or the merchant. Let me tell you my Groupon story…. My friend bought some Groupon vouchers for a fish pedicure as a Christmas present at Pasha Clinic in London. After a month of phoning an engaged line and sending regular emails into the ether in an attempt to redeem the vouchers before they expired, my friend was getting somewhat agitated. The customer service team at Groupon who claim on the website that “Nothing is more important to us than treating our customers well.” Suggested she just keep trying. Eventually, after six weeks she got through and had a rather heated conversation with Pasha Clinic who didn’t have any weekend availability before the voucher ran out. They did offer up a weekday lunchtime. Although she then added that if we had paid full price they could have found us an appointment. My friend ended up putting the phone down on the less than satisfactory response from Pasha Clinic. Then she received this email. I kid you not. “you are extremely rude. i cancelled your name from our system. you failed to provide proper details of your voucher and still blaming us on being late. You should be saying sorry for taking our time with your incopitance to provide basic voucher detail. you have no telephone manner at all. it is sad that you live in the most civilised country but have no idea about being civilised. Groupon were very apologetic about the above email and have given my friend Groupon credit for the vouchers. Presumably so she can waste another six weeks of her life chasing another great value deal. Bet she can’t wait. 1. Firstly the customer service of Pasha Clinic is so terrible it’s practically comedy. Pasha Clinic I wont ever use you – even though your website looks quite good. 2. I’m sure that Pasha Clinic are not the only company to have been inundated by customers. (I understand that one coffee shop in Portland was swamped with a stampede of over 1000 customers on the first day.) However, Groupon officials state that ‘deal’ subscriptions should be capped in advance to a reasonable number to deal with this situation. 3. Companies need to consider carefully what a Groupon deal means to their business; can they cope with the increased business, are the terms and conditions on the deal right, are they sure they are not actually driving themselves into bankruptcy? 4. However much of a mess merchants get themselves into there is no excuse for poor customer service and the above email. 5. The weather is getting warmer and my trotters are not up to scratch. And you know how important good trotters are to a lady. I’d love to know if you have had a good or bad Groupon experience. If you are interested in the Groupon phenomenon, Bob Phibbs the retail doctor has quite a lot to say on the matter too. P.S. And while we are on the subject, Groupon recently made an ‘interesting’ Superbowl advert in which actor Timothy Hutton begins by making a plea for the people of Tibet before delivering the punch line: “But they still whip up an amazing fish curry” Groupon have apologized and the ad has been withdrawn but you can watch it here. This entry was posted in customer service, failure, fish pedicure, health and beauty, Innovation, Inspiration, love and tagged appointment, bankcrupt, beauty, bob phibbs, business, christmas present, coffee shop, complaints, curry Tibet, customer service, deal, failure, feet, fish, friends, glamour, graph, groupon, health, london, merchant, pasha, pedicure, rude, salon, special deal, special offer, stories, superbowl, timothy hutton, trotters, win. Bookmark the permalink. Groupon customers have a bad reputation and habit of being impatient and as well as being entitled. Having had personal experience on the vendor side of things the salon was probably just fed up with this immature behavior, and snapped. If they are booked they are booked, they tried to give accommodation to your friend by booking her when they could. As an adult woman she should have known that the only thing a fit will get you is black listed. Thank you for your comment. I understand that companies participating in Groupon may not be able to meet demand. However the level of customer service they provided was laughably poor. If the purpose of a Groupon promotion is to increase customers then organisations should be better at managing customer expectations.